Nursery Week at a' la mode! Hello A' La Mode readers! 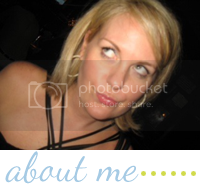 My name is Laurel-Dawn and I am the blogger behind Abode Love. Shelli was kind enough to invite me to her lovely blog to share a project I just completed for my nephew, Raleigh Oliver. After a lot of hard work and planning from afar, this friends of the forest nursery has come together to welcome this precious wonder into the world. I couldn't be happier with it! 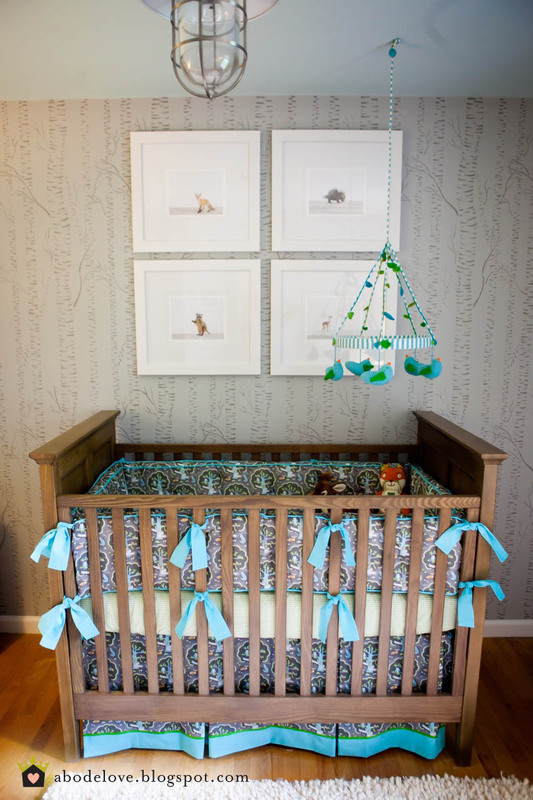 Nene (my older sis) had the wonderfully talented Carrie Tabb over to shoot Raleigh's newborn photos and she snapped these gorgeous images of his nursery... I couldn't be more thankful for such beautiful images. Thanks Carrie! I love this sweet vignette. 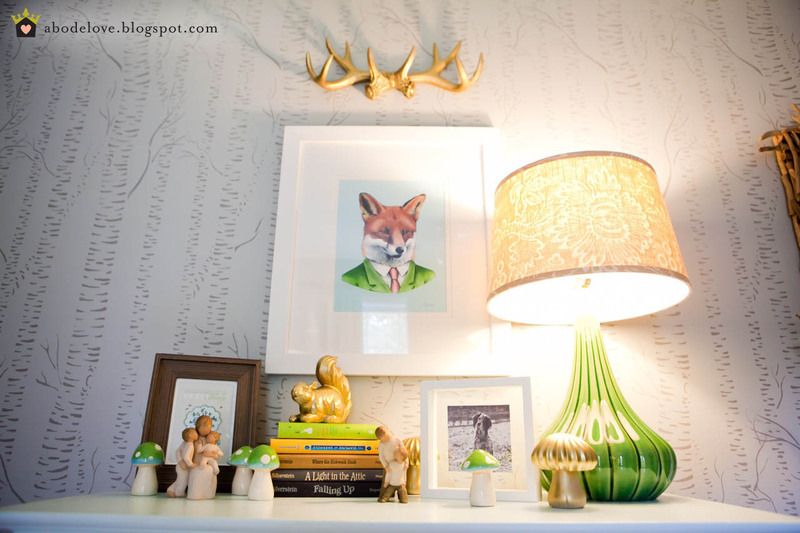 The fox print is quirky and the colors are perfect for the space, it was $35 via Berkley Illustration, Etsy. 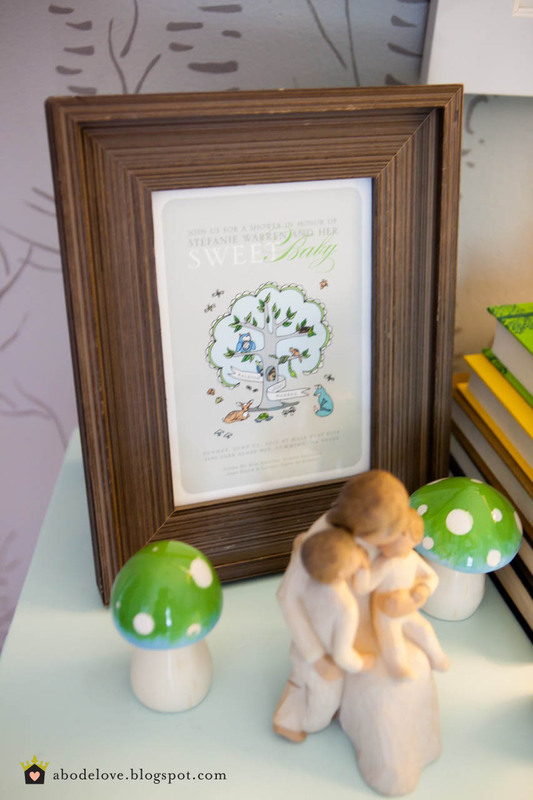 We framed everything in white mats with white frames to keep it simple and fresh. The birch trees were stenciled on the walls by yours truly. (That's right, I drove to Atlanta and painted from morning until night) It was a labor of love- I think it turned out great! Here is the post specifically about the stencil. 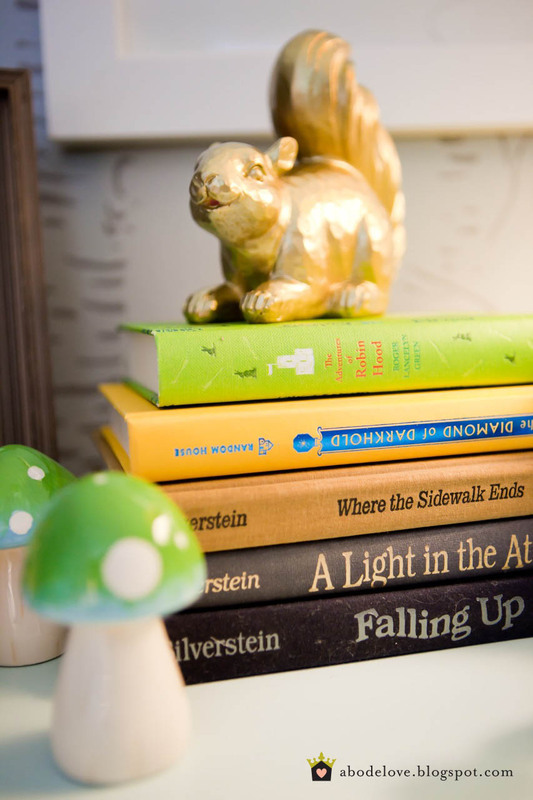 The mushroom-esque green lamp was a steal from Home Goods a few years ago and the lampshade is from Pottery Barn. The gold antlers are from Hobby Lobby and were spray painted gold. That sweet little nugget resting on the pale aqua dresser is Raleigh... my sister and brother-in-law made him from scratch. 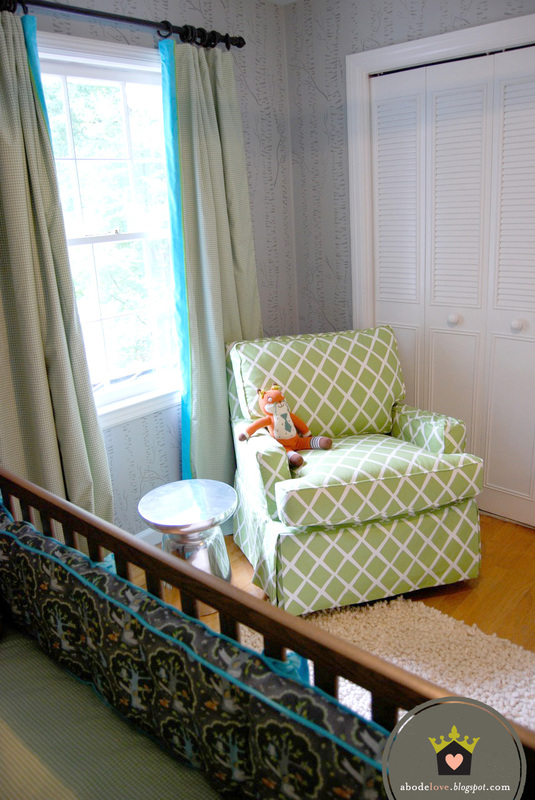 This fabric is what brought the whole nursery to life, it was the fabric that set the tone and color palette for the entire space. It's a gorgeous pattern via Beck & Lundy, Etsy as well. My supermom MADE these gorgeous bumper pads and bed skirt. We loved the combination of the aqua and grass green gingham. My mom rocked these bumper pads... they are amazing! 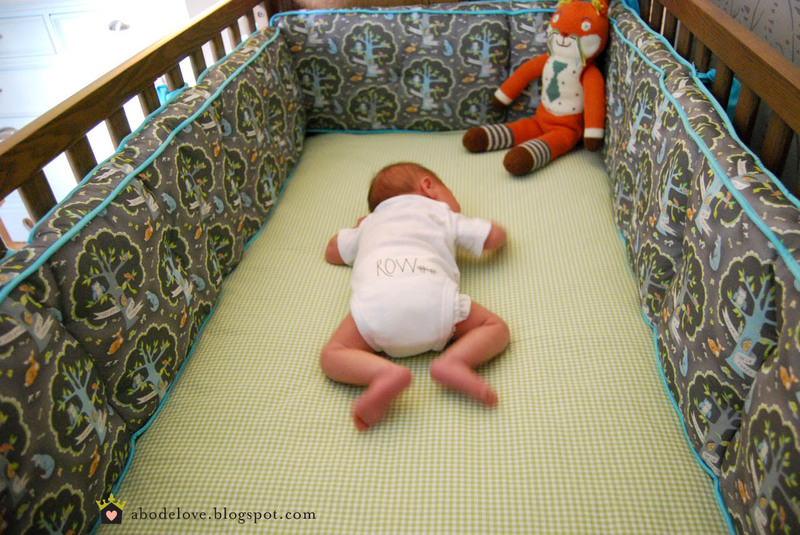 The Hampton Crib is a little beauty that we found at Restoration Hardware on SALE! 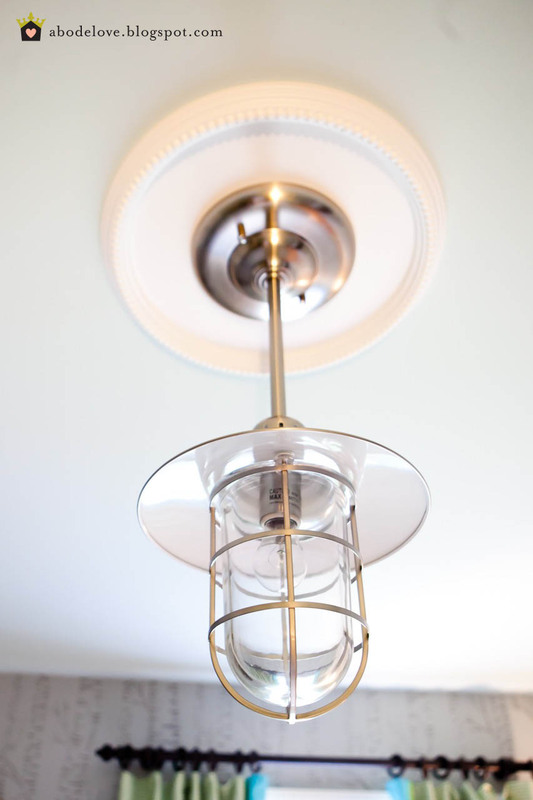 It's no longer available, but we love it! 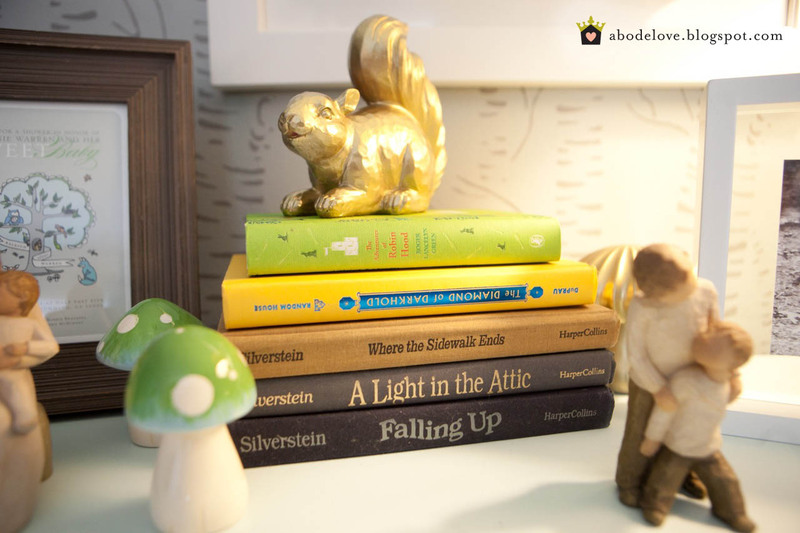 The little mushrooms and squirrels were found on the 80% off section of Hobby Lobby and I painted them to match the room. I love the sweet whimsy that they bring to the room- I especially love the gold squirrel. 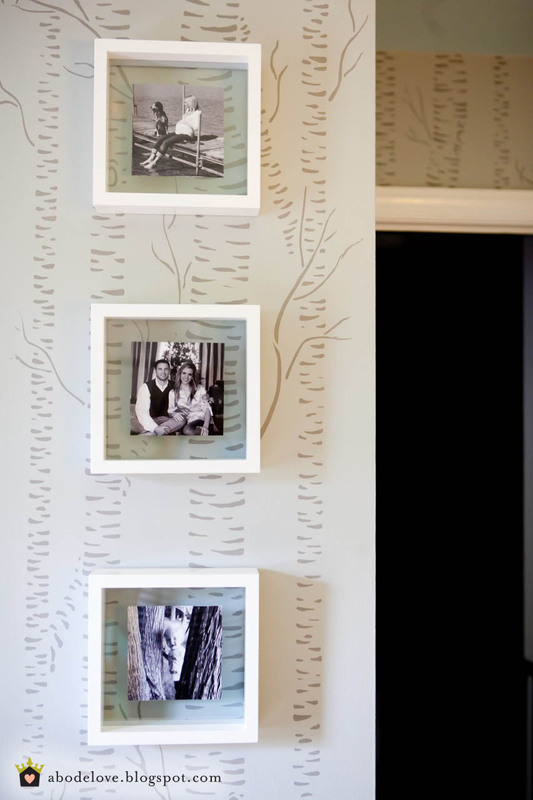 We wanted to add family photos to the space so we added these West Elm floating frames and printed black and white photos of mommy, daddy and big brother Preston to add a personal touch to the room. 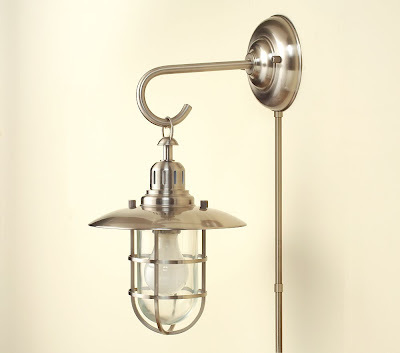 I also replaced the skank ceiling fan with this sweet little lantern from PBKids. Here is that precious Raleigh-Man and his beautiful mommy, Nene. 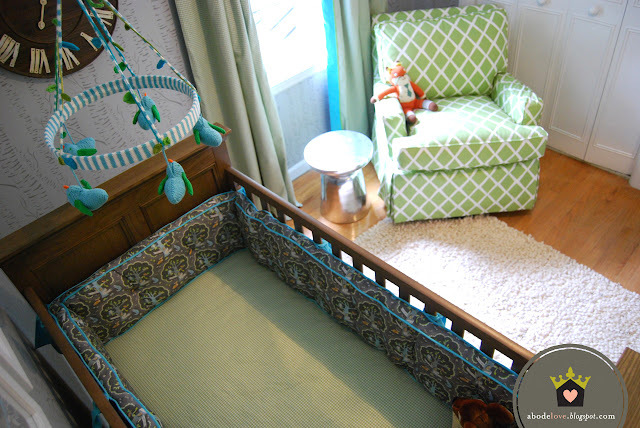 In the background are green gingham drapes- my supermom added teal trim to the edges and it truly finished the look beautifully. Good call Mommio! In this photo we were still waiting for the glider from Serena & Lily- It's pictured below. 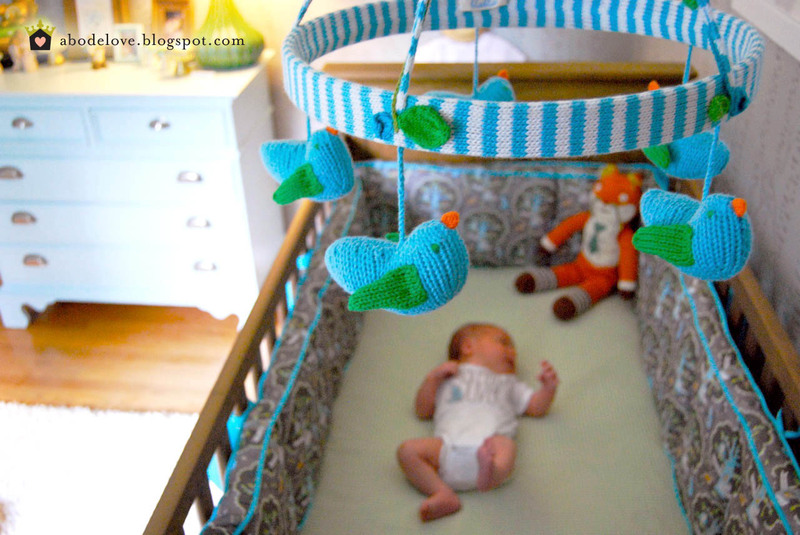 This precious little blabla mobile is just the sweetest... they have the greatest mobiles and dolls! We also have a little blabla Fox sitting in his little crib... so cute! I really love this little corner of the room. 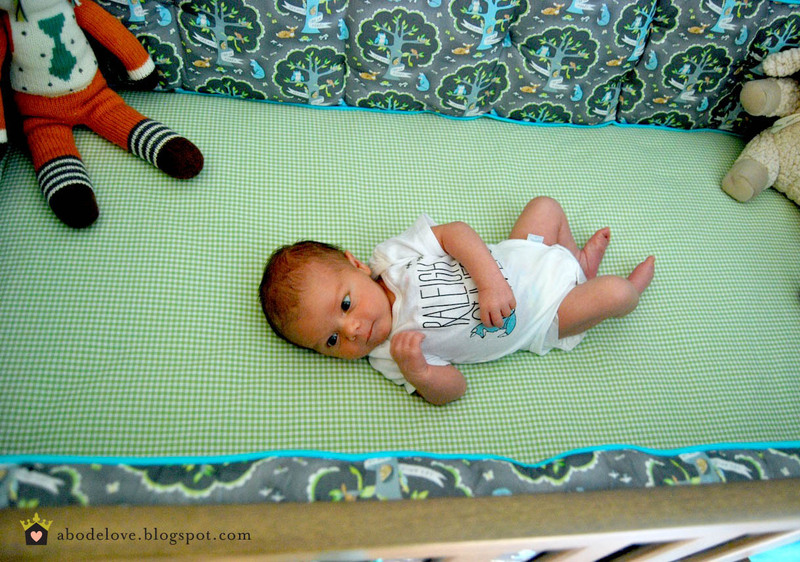 The large laundry basket was something Nene already had, and the small green striped basket is a new item from West Elm. 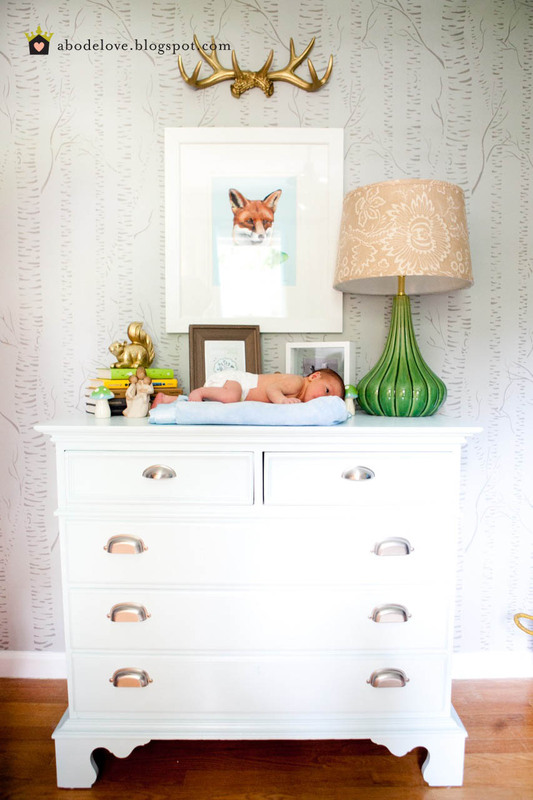 The driftwood mirror came from PotteryBarn Teen and the sweet little outfit and hat finish up this corner and give it personality. Here is the Serena&Lily glider... I have quite a story to go along with this sucker. It's unbelievable... check it out here. Isn't the little side table sweet? 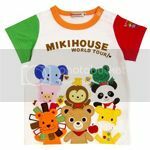 It will be perfect for resting items while rocking like bottles, phones, burp cloths or books for when the little tike is older. That sweet bla bla fox owns me... how cute is he!?! 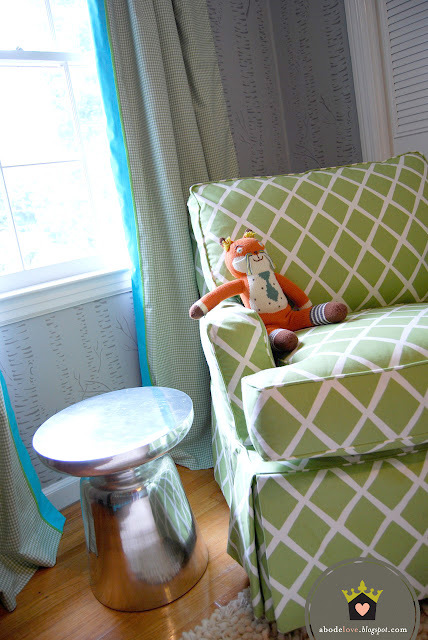 The large diamond pattern on the glider is a lovely contrast to the tight patterns in the other fabrics used in the room. 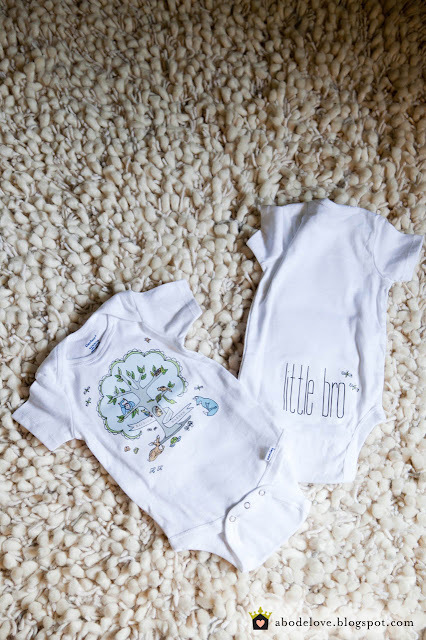 These onesies were a DIY that I also made for Raleigh's baby shower... aren't they presh? 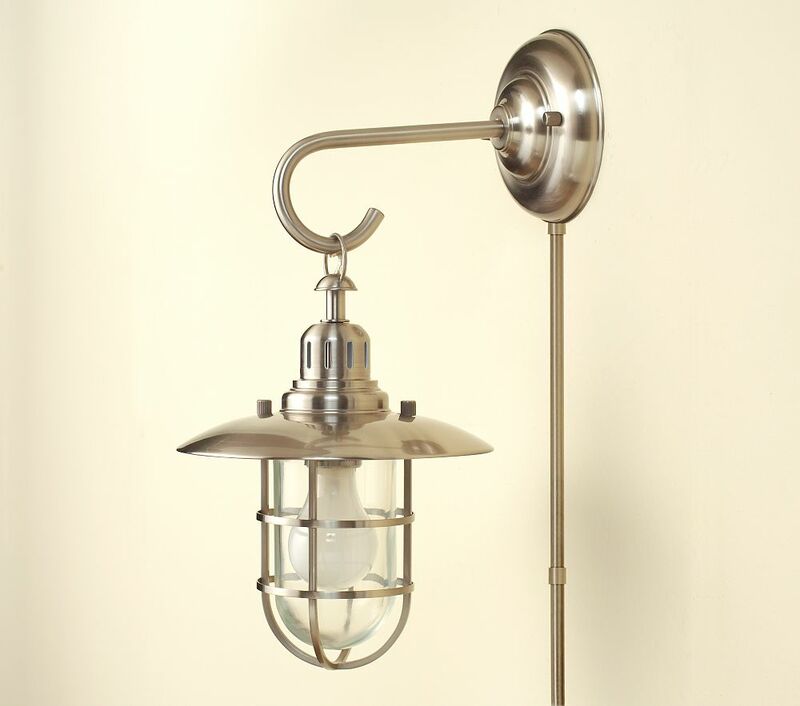 Here is a photo of the PBKids Fisherman Sconces that are going to hang on either side of the crib- I can't wait for them to arrive! I hope all of you enjoyed my friends of the forest nursery! Thanks again to Shelli for having me as a guest today! 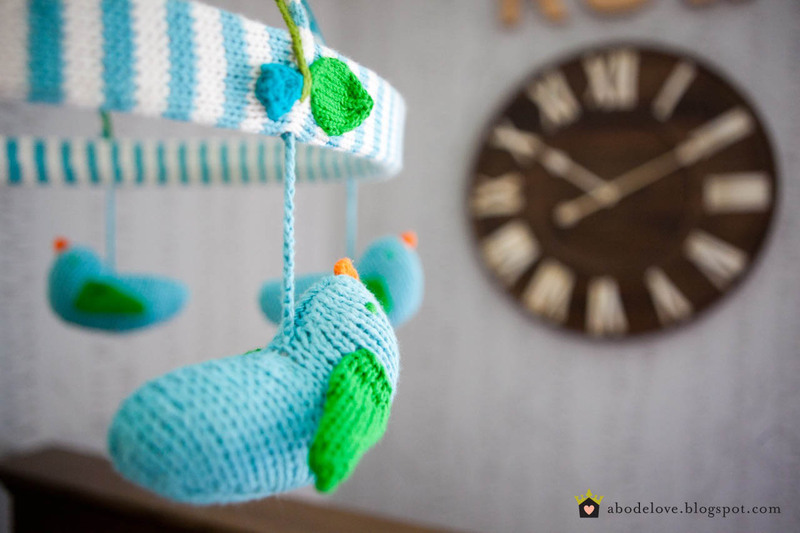 Have a wonderful day and stop by Abode Love sometime and pay me a visit! 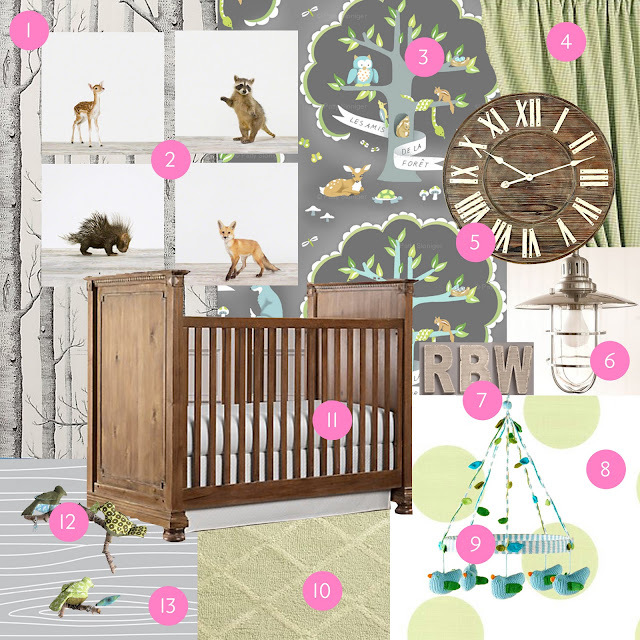 (it doesn't have to be yours, share pics of a friend's nursery or create a nursery mood board!)??? It's my FIRST Linky Party! 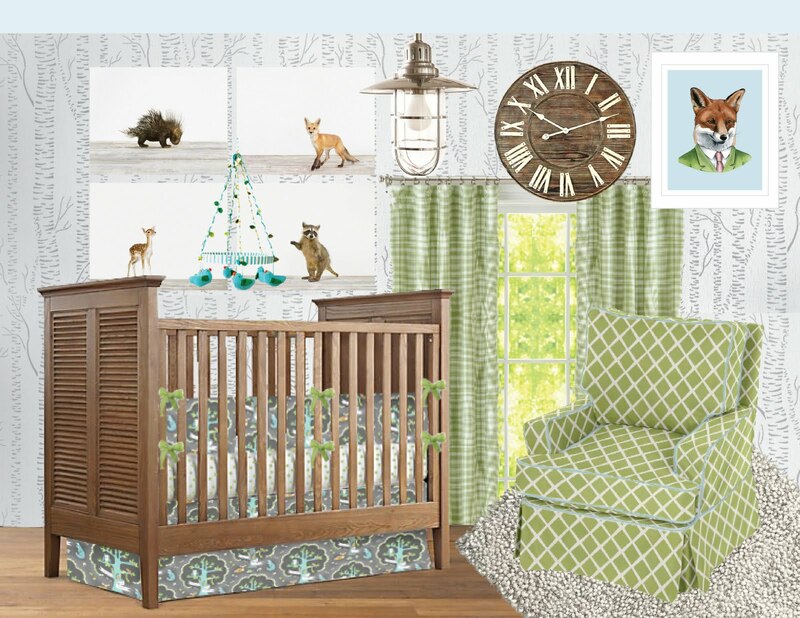 That is a smoking cute nursery! Every detail.....perfect. 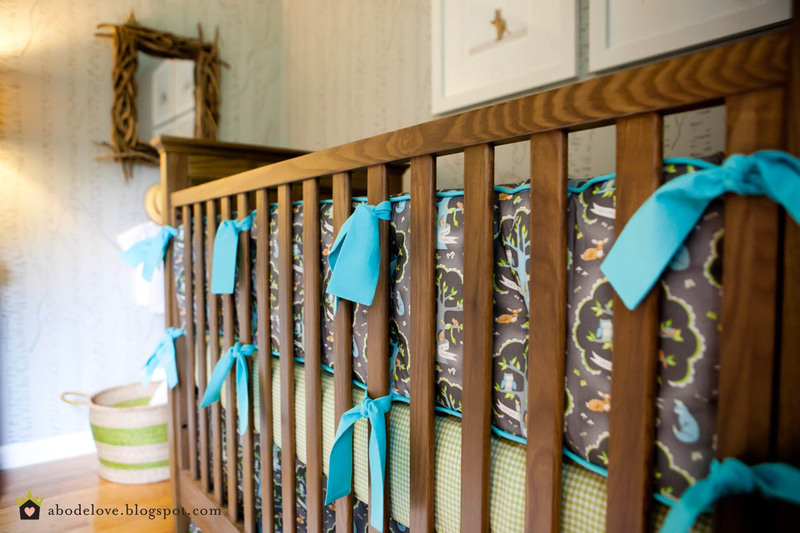 Best nursery ever!!!! The wallpaper totally makes the room! I LOVE all her work- shes amazing! The wallpaper and lighting. Beautiful. Wow. What an amazing room. There are so many details. Thanks for sharing. 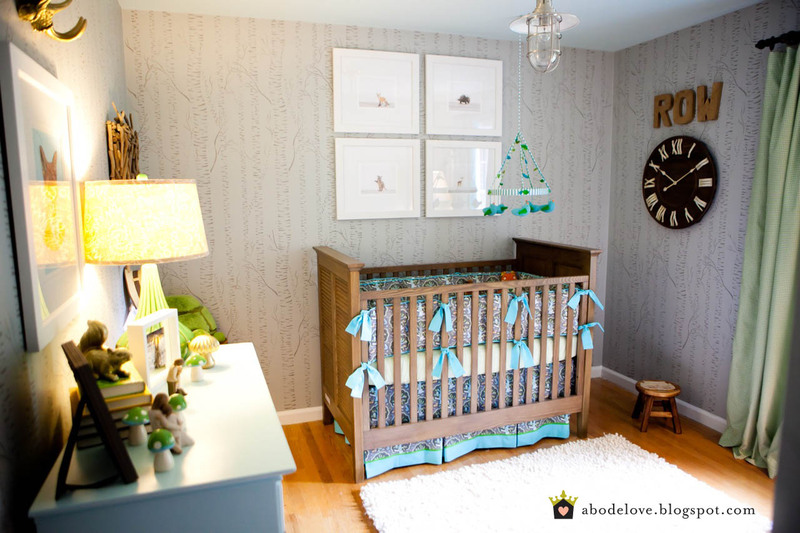 That nursery is gorgeous...the wallpaper and gold antlers are perfection! Thanks for all of the compliments! The walls are actually stenciled! It took FOREVER but was SO worth it! 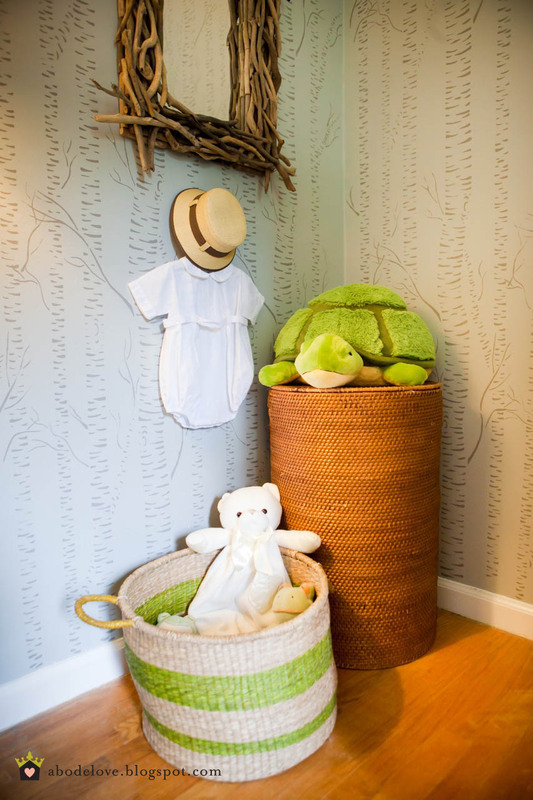 This nursery is incredible. I love everything about it! 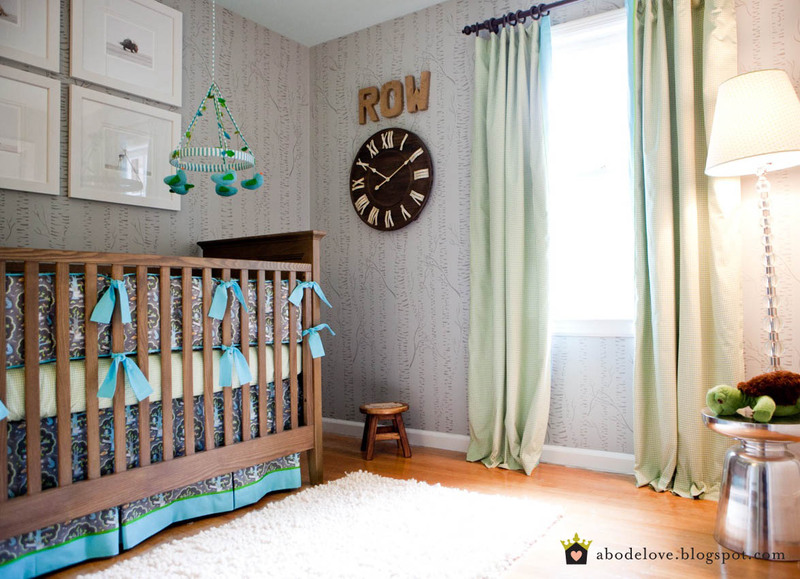 This nursery is one of my favorites ever! I love the wallpaper --oops, just read they were stenciled- WOW! Even more impressed!! I definitely need to check out Abode Love- heading over . . .
A gorgeous nursery for a precious baby! 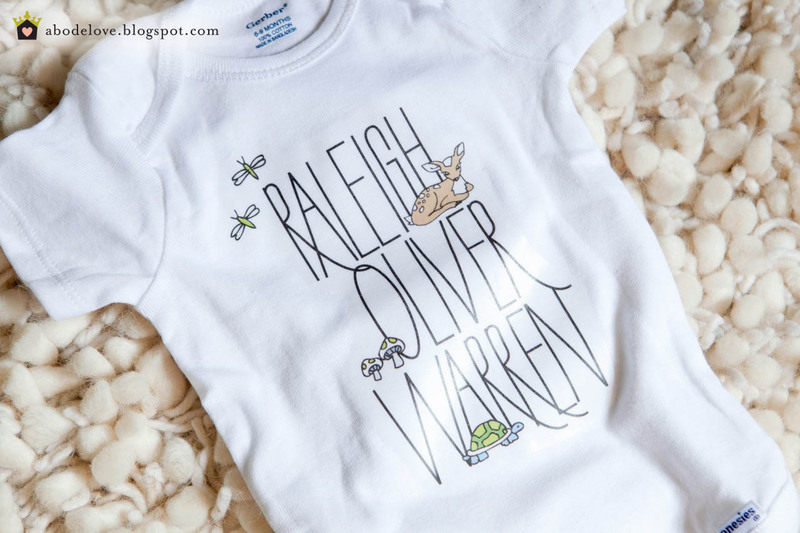 What a cutie little Raleigh is! Every single detail is amazing in the room. What a precious room. 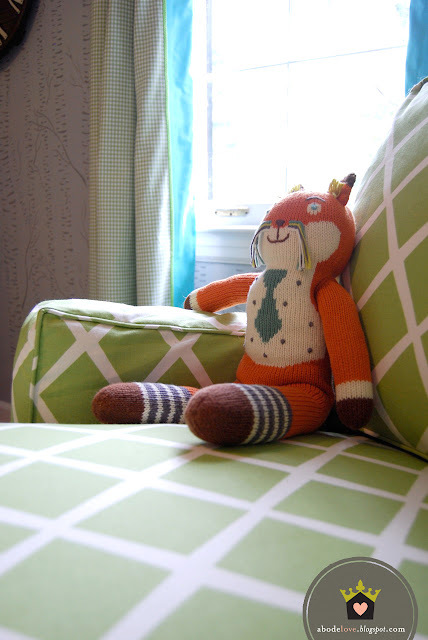 I love the mix of patterns and the masculine features. Great job! Really... that's what she looks like after JUST having a baby... really... Amazing! 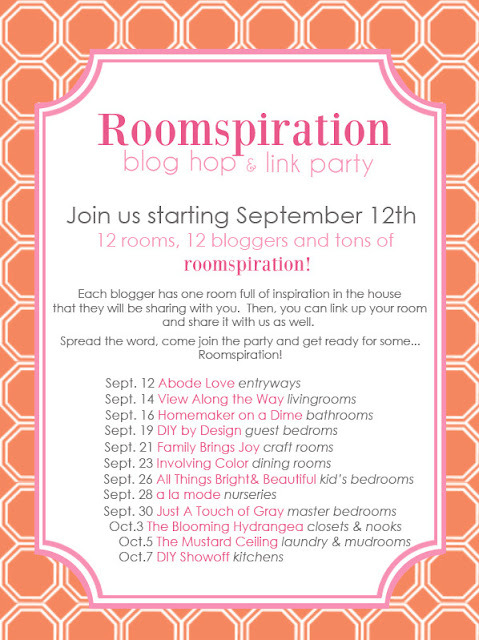 Calling All Future Reality Stars! 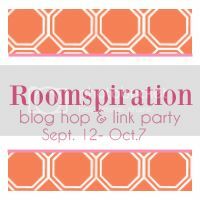 My Queen Guest Room Makeover!